Reigning Top 14 champions Clermont Auvergne face an uphill struggle on Friday night as they seek to see of the might of Toulouse and book a fifth straight final appearance. Les Jaunards progressed to the last four after seeing off Biarritz 27-17 in the first round of play-offs, but will now have to raise their game against the side that finished the regular season as runaway leaders. Toulouse haven't been crowned kings of France since beating Clermont back in 2008 but Guy Noves' men will fancy their chances this time around, as long as they can avoid the fat suffered at the Stade Marcel Michelin in December, when the home side were 32-25 victors. Toulouse - Player to Watch: Louis Picamoles has been recalled to the France squad and the powerhouse No.8 will want to impress in what could be his last game of the season at club level. Toulouse - Team News: Winger Vincent Clerc has been included in the side although doubts surround a rib injury, with Rupeni Caucaunibuca expected to step up from the bench should he be required. Yannick Jauzion is back in the midfield mix where he will partner Clement Poitrenaud and as a result Florian Firtz drops to the bench. Jean Bouilhou is favoured ahead of Yannick Nyanga at flanker while Romain Millo-Chlusky returns to the second row. Daan Human is also back on duty at loose-head ahead of Jean-Baptiste Poux. Clermont Auvergne - Player to Watch: Morgan Parra has the experience and class to outdo the inexperienced Jean-Marc Doussain in the scrum-half battle, but he will need to be on his toes. Clermont Auvergne - Team News: George Pisi has been named at outside centre despite concerns over a hamstring injury, with Marius Joubert poised to step up from the bench should he be forced to withdraw. Lionel Faure comes in for Vincent Debaty at loose-head while Elvis Vermeulen gets the nod ahead of Sione Lauaki at No.8. Skipper Aurelien Rougerie remains sidelined through injury. Key Battle: The lineout will be fascinating, as Jean Bouilhou and Julien Bonnaire add their nous from the back-row to an already combustible set-piece. Trivia: Toulouse have beaten Clermont in four previous finals, the most recent in 2008. Stats: Clermont's title win last season was their first in 11 final appearances. 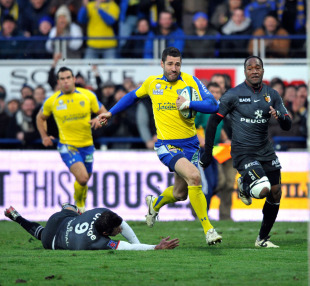 Prediction: Clermont have only intermittently shown their best form this season, leaving Toulouse as the favourites.